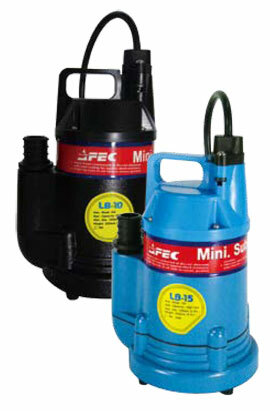 LB-10 / LB-15 Uittly / Sump Pump give you a lot of fun creating streams and waterfalls in your garden pond, excellent for removing rain or flood water from your floors and any other locations. Outlet - 20 mm (3/4 in.) or 25 mm (1 in.). LB-10: 6 m /20 ft., LB-15: 6.3 m / 21 ft.
LB-10: 60 l/min / 16 gpm, LB-15: 70 l/min / 18 gpm. Oil-free motor - safe for fish and plants. Aluminum alloy outer case - lightweight with excellent cooling effect for 24H running. Stainless steel 410 shaft + 3 lip seals - quiet and long lasting. Thermoplastic impeller - easy mointenance and service. Removable filter screen for easy cleaning. Max. liquid temperature - 40°C (104°F). Standard cable length – 3m (10 ft) or longer upon request. Tethered float switch is available upon request – LB-10A and LB-15A.